Arianespace’s ability to meet the Pacific region’s launch services needs with its highly capable launcher family and proven reactivity was underscored at the Pacific Telecommunications Council’s (PTC) annual conference being held this week in Honolulu, Hawaii. The company’s capacity to accommodate a full range of payloads enables Arianespace to maintain a strong market position in countries across the Pacific rim and Asia, according to Jacques Breton, Senior Vice President – Sales & Business Development, who participated in the PTC meeting’s Satellite Industry Luncheon Panel. 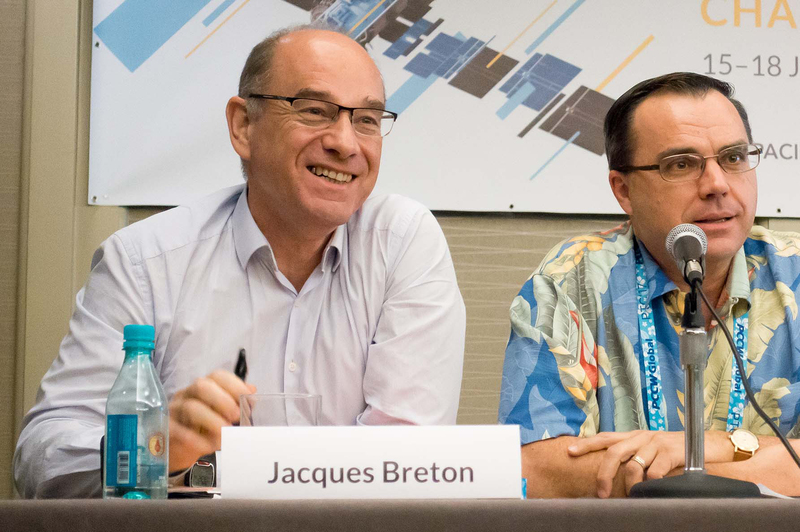 Arianespace’s Jacques Breton was one of seven participants in the Pacific Telecommunications Council annual meeting’s Satellite Industry Luncheon Panel. He noted that Arianespace’s competitiveness with its launcher trio (composed of the heavyweight Ariane 5, medium-lift Soyuz and lightweight Vega vehicles) will be further enhanced with future introductions of the modular Ariane 6 and evolved Vega-C – currently being developed in Europe. The Arianespace launcher family is well suited to evolving requirements of the pan-Pacific region, reflecting the “Changing realities” theme selected for the PTC’s annual conference. Looking to 2017, Breton said Arianespace is targeting as many as 12 missions during the coming 12 months, providing a strong follow-on to a busy 2016 that involved 11 successful launches from its Spaceport operating base in French Guiana. Arianespace’s early 2017 activity includes a mid-February liftoff of Ariane 5, which is to loft the Indonesian Telkom-3S relay platform as one of two communications satellite passengers on the heavy-lift flight.